Historically one of Bordeaux's greatest wines, Cheval Blanc has been top of the pile in St.Emilon for the last 50 years. It is only in recent years that its place has been threatened (some might argue even surpassed) by the renaissance at Ch Ausone. Separated only by a ditch and a road from Pomerol, Cheval has always had a unique style of its own. 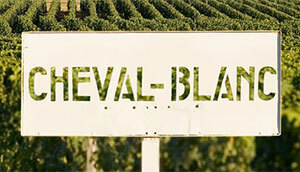 Neither typically St. Emilon nor Pomerol in character, "Cheval Blanc is Cheval Blanc", so says Robert Parker. This is thanks in part due to the unusually high proportion of Cabernet Franc used in the wine. Nowhere else in the world does this variety come into its own as it does in the soils of this illustrious estate. Since Pierre Lurton took to the helm the quality and consistency of this incredible wine has been pushed even further.